Infinity Health and Wellness Center: Healing MS with Food! I‘m always seeking information on how good foods help my body to maintain itself, inside and out. Buying high quality foods can be hard at times because it takes more financial creativity to eat healthy. There’s the “Whole Foods and high priced supplements” diet plan, which is what most people think of when they hear, “eat better.” But with some research, it’s really possible to get what your body needs without spending a fortune. My grocery bill for two people in Los Angeles is about $100 a week (shopping at Trader Joe’s and our local health food store); we buy mostly organic veggies and fruits. We don’t eat any processed, pre-packaged items and we don’t drink sodas. Snacks are kale chips, homemade granola, fruit, fermented vegetables and once in a while French Fries from our favorite fry shop (our one weakness). I realize eating like this cost more than downing soda and pizza a few times a week. And we invest time cooking delicious, nutrient dense meals. But it’s totally worth it for disease prevention. And in some cases, healing disease. Don’t believe me? Watch this Ted Talk with Dr. Terry Wahls. Dr. Wahls talks about her recovery from progressive Multiple Sclerosis that had forced her into a wheel chair for four years. She’s now able to ride her bike and live a normal life. After using all of the medications offered for MS and she still wasn’t getting better, Dr. Wahls began to study how food repaired the brains of mice. And then she used herself as a human experiment. She breaks down in understandable terms what food is doing to support the brain (or destroy it) and other parts of the body. I was fascinated throughout her 17 minute talk. I’m happy that Dr. Wahls is a medical professional who discovered she could heal herself through foods. For some people, only hearing something like this from a medical doctor will convince them. Of course, lots of holistic nutritionists and others in the natural community have been touting this for years. We realize the food pyramid is a joke. And of course, when anyone points out that much of the ills plaguing Americans are diet-related, there’s lots of push back. I eat very similar to the diet Dr. Wahls talks about (except for the meat part. I get my protein from vegetables and grains). One of my neighbors stopped me yesterday when I was walking to the farmer’s market in my neighborhood. She said she wanted to eat healthier and lose some weight. She’d just bought a blender and wanted to know what I put in my smoothies. Green smoothies (made with kale or spinach as the main ingredient) are a wonderful way to sneak all sorts of nutrients into your body. And as a result, you’ll get prettier skin, healthier hair and more energy. You may clear up some other major issues, as well. I know lots of people tout how they drink smoothies regularly, but when I talk to them, they’re really making fruit-based desserts, not a healthy nutrient-packed power drink. Here’s a list of great foods to put in smoothies and why I recommend them. Of course, this is just to get you started. Be creative and make your own masterpieces. Kale – I love when Dr. Wahls says in her talk that kale “has the most nutrition per calorie of any plant.” Kale is an incredible super food packed with health benefits. Just one cup of kale provides 133% of the daily allowance of Vitamin A and 134% of Vitamin C. Vitamin A helps in sebum production, which makes hair healthy. And Vitamin C helps build and maintain collagen in skin. 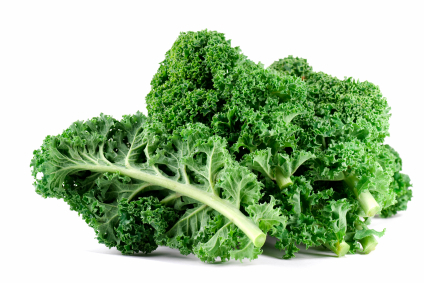 Kale also contains B-6, Calcium and Iron. It’s so easy to blend one cup of kale into a smoothie. I also make raw kale salads and kale chips a few times a week. Spinach – This green leafy veggie is a good source of potassium (more than bananas!) and iron. Potassium helps the body build protein and muscle. Without iron, we can experience lack of energy, weak nails and dull, shedding hair. Beet juice - These deeply-hued veggies are great for detoxing the liver. And according to WebMD, “Emerging studies suggest that beet juice is one of the richest dietary sources of antioxidants and nitrates that may improve blood pressure and blood flow throughout the body, including the brain, heart, muscles, and more.” Because beet juice is so powerful at detoxing, I only put it in my smoothies once in a while. They have to be juiced in a juicer before adding to smoothies. Avocado – It took me a while to warm up to avocados. I thought I was allergic, but then realized I was responding to the pesticides when I didn’t buy organic. Now I slice avocado for my smoothie a few times a week. They’re great for adding a smooth texture (I don’t like bananas) and they contain almost half of the recommended daily dose of fiber. Cilantro – I love the taste of cilantro and put it in a lot of foods. Sometimes I add it to my smoothies as it’s said to assist with heavy metal detoxing. Flaxseeds – I used to buy a very expensive, cold pressed flaxseed oil from Whole Foods. Through some research, I found huge bags of organic flaxseeds for far less money. I crush a few spoonfuls at a time in my food processor and shake into my smoothie (I also put it on salads). Flaxseeds are rich in Omega-3 fatty acids, lignans and dietary fiber. Diatomaceous Earth – I use this food grade earth to cleanse the intestinal track and assist with growing healthy hair and nails. I add a teaspoon to my morning smoothie. I can’t even tell it’s in there. Homemade Almond Milk – My guy and I make our own almond milk so we’re sure it’s fresh and pure. It’s super easy and fast to make and it tastes great in smoothies and on cereal. Lactose in regular milk makes me sick. Yogurt is fermented, so I can eat it. Fruit? Lots of people ask if I put any fruit in my smoothies. I do, but sparingly. Sometimes I’ll add a lime, toss in an apple or squeeze some orange juice for extra liquid. When I’m in a hurry, I’ll even cheat by using coconut water (raw, unpasturized is best but it’s VERY expensive). Frozen organic blueberries are my usual fruit choice because they’re great antioxidants. If you’re new to making healthy smoothies and you really need fruit to help you get your drink down, start out with a few sweet fruits mixed with your green veggies (mangoes, pineapples and peaches work great), but make it your goal to make your smoothies more about the greens and veggies than fruits. You’ll have a healthier smoothie without taking in lots of sugar.